Pip made the most delicious tomato sauce, that we used on top of feta stuffed baked mushrooms. I don't really know if it should be called a sauce, but it is really quite versatile. You could use it on bake fish, or roast chicken or even just as a pasta sauce. It is everything I love about food; simple, fresh ingredients and flavours combined in the perfect quantities to make something just exquisite. Heat 2 tbsp oil in a pan over medium heat. Cook garlic, stirring 1-2 minutes until softened. Add tomatoes, then cover and cook over a low heat for 3-4 minutes until tomatoes soften but still hold their shape. Remove pan from heat and stir in hand shredded basil leaves. Serve on top of bake feta mushrooms, with chicken or fish or as a beautiful, fresh pasta sauce. 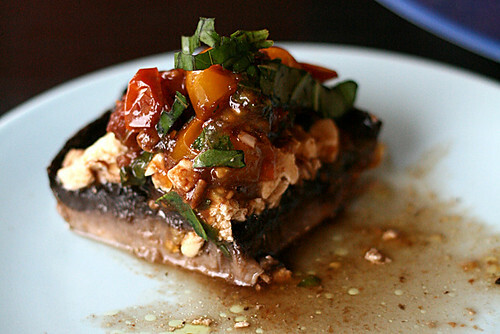 Place mushrooms in a baking dish and drizzle lightly with olive oil. Bake for approx. 10 minutes depending on size of mushrooms. Crumble cheese on top and bake until golden brown. Serve with tomato sauce. Combine equal parts of the avocado and cream cheese with a splash of lemon juice and dill to taste. Mix until well combined. 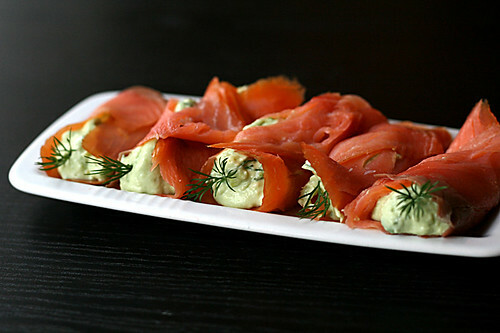 Spoon onto smoked salmon and gently roll up. Serve immediately. Easy! The salmon and avocado roll is right up my tastebud alley! I cant wait to try this, I love both and together in a roll like such is genius!!! mmmm! I love that first feta mushroom photo! 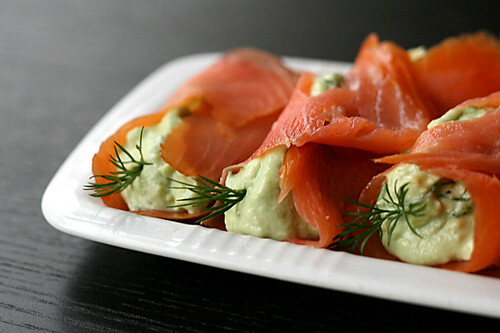 smoked salmon and avocado - interesting. 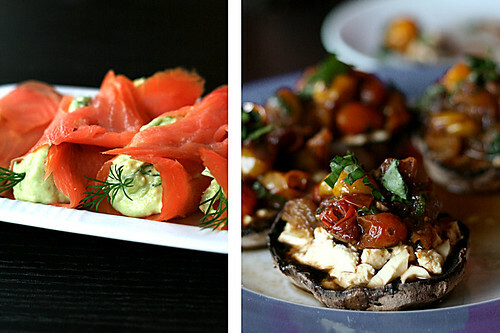 My stomach is in the smoked salmon mode lately so I will definitely try your combo. fresh365 - thanks erin, the other 4 mushrooms were just as yummy too! Jas - no salmon?! awww but it is so good for you! Jo - Hope you enjoyed the combination, it is quite rich and satisfying.